Semester grades are calculated based off two 9 week grades and an exam grade. For courses that have an End-of-Course (EOC) assessment, the exam grade is worth 30% of the overall semester grade (refer to the table below at right). 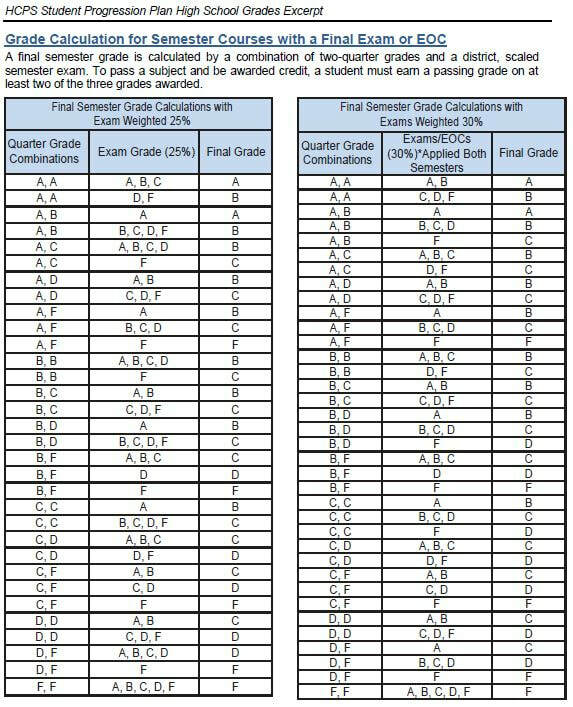 For all other classes, the exam grade is worth 25% (refer to the table below at left). The semester 1 grade is based off the student's quarter 1 and 2 grades, and the midterm. The semester 2 grade is based off the student's quarter 3 and 4 grades, and the final exam or EOC. Students earn 0.5 credit if the final semester grade of a high school course is a D or higher.